Entertain in style and never serve a cold dish again, with the Tru Dual Crock Buffet Slow Cooker. This amazing party companion offers two 1.25-quart pots for serving food, with the ability to heat on low, high and warm to suit any stage of the evening. Whether you’re serving up fresh pasta sauces, piping hot curries, or heartwarming soups, there’s ample space to give your guests some variety and show off your cooking skills with minimal effort. 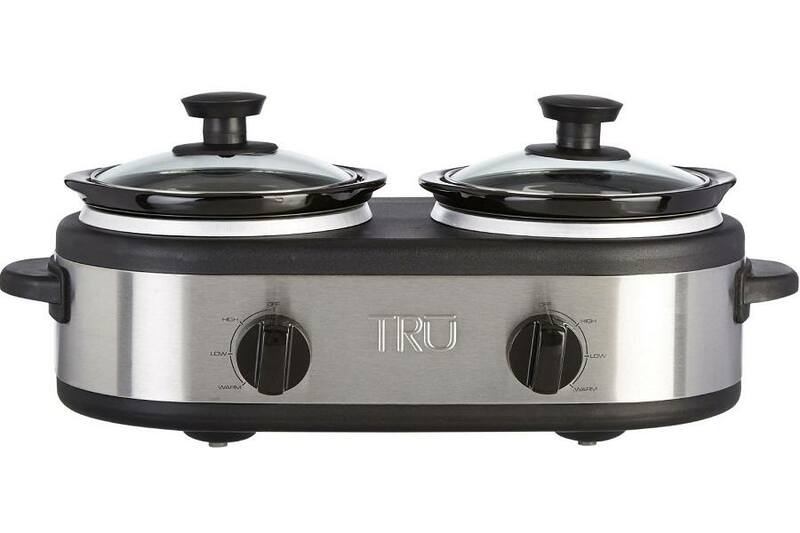 The Tru Dual Crock Buffet Slow Cooker is ideal for entertaining, with two separate stoneware inserts. Each pot has its own temperature setting, so you can have two meals cooking at once for your guests. Food is served fresh and hot with this slow cooker, and the stoneware inserts help it to keep in the rich flavours and aromas. Safety is of the utmost importance with the Tru Dual Crock Buffet Slow Cooker, with a range of features to keep both you and your guests safe. With sturdy rubber feet, you can be sure it won’t slide off the bench as you dish up meals, and the cool touch handles make it a breeze to carry around without being burned. Once the party is over, simply remove the pots from your slow cooker and give them a wash for easy cleaning and maintenance. The glass lids can be placed in the dishwasher or hand washed for absolute convenience. With three simple settings, it’s a good appliance to take to parties for reheating food or serving small portions of sauces. The ability to have a different temperature setting for each pot makes it versatile as you can have two different dishes cooking at the same time. Although there are two crock pots available with this product, each only fits around 1.25 quarts so it’s a little on the smaller size, especially if entertaining a large crowd. Not recommended for the dishwasher so may take a little longer to clean than others. 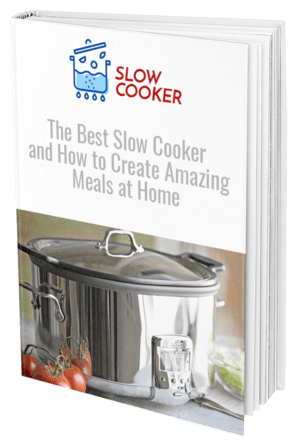 The Tru Dual Crock Buffet Slow Cooker is the perfect addition to a dinner party or event where you want to keep the food hot and flavoursome. Although it’s a little on the smaller side with only 1.25 quart capacity on each side, you are still able to serve up some great dishes from here. 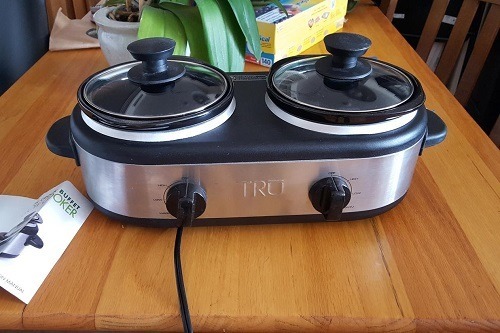 This dual buffet has two separate settings for each pot, giving it a range of versatility that most slow cookers don’t have. There’s no word on whether you can use this in the dishwasher, so cleaning up may take a bit of time once you’re done eating. Overall, this product is extremely well priced for the functionality it brings and is sure to be a hit at your next event. 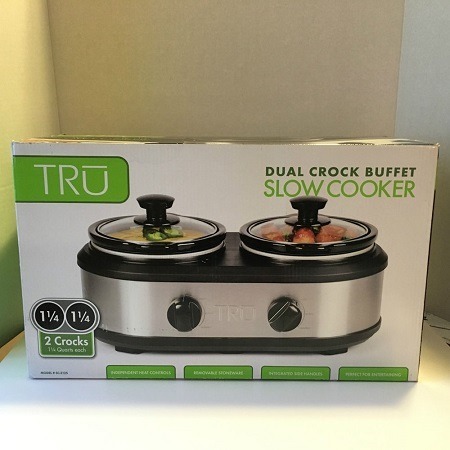 To get your party started in style, purchase the Tru Dual Crock Buffet Slow Cooker today.